Northburn development and consultancy are a commercial property development company with expertise in the retail and mixed use sectors. They are based in Co Down, Northern Ireland but art active in projects across the UK including the Inverurie Retail Park in Aberdeenshire, Scotland. 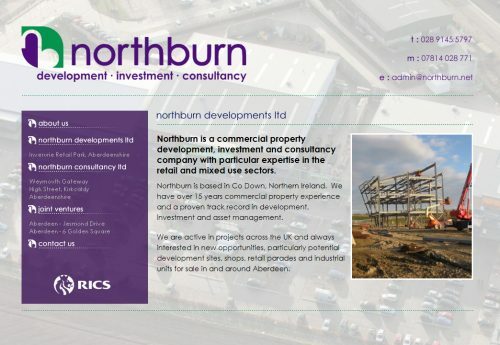 Northburn have used Ardnet Online Solutions for several years to provide Belfast web design and this is the second version of the website, which now includes photo galleries and information on many of the consultancy and development projects undertaken by the company. The website uses java technology rather than the outmoded flash animation to fade and rotate photographs and also provide photograph lightbox facilities to the galleries, this bounces an enlarged version of a photo onto the screen and dims the rest of the website when a smaller version is clicked.